Some of my most prized possessions from various international destinations are the wine and liquor I manage to drag home. Maybe I enjoyed this particular Kazakh cognac with friends, or that bottle of Saperavi wine was a gift (from the President of Georgia, perhaps?). Alcoholic beverages act in the way a great souvenir should: a very piece of that region brought into your home that’s a fun and usable way to remember your journey (empty bottles and used corks are cute, too!). For this reason, I am very selective and protective of the bottles that are worthy enough to make it into my suitcase (more on packing these items in upcoming Traveling Tip Tuesdays). A smattering of booze I’ve carted home over the past few years. Unopened and glorious. ge component of the Department of Homeland Security which functions as the organization for all things “coming in”. Border security, trade facilitation, and traveler screening are all included in this agency, so it seems logical that bringing in bottles of valuable, flammable liquids would be dependent on its regulations. Many 21-years-or-older travelers feel restricted when it comes to choosing which single bottle of wine to pack in their checked luggage (no carry-ons here! 3.4-ounce-rule still applies!). The truth is, there is no federal limit on the amount of alcohol you may import into the U.S. for personal use (click here for the CBP website). 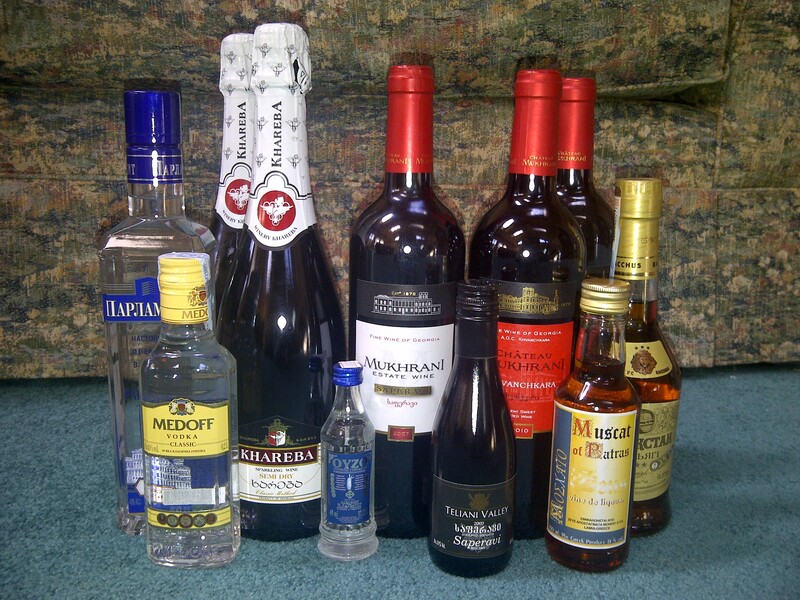 Generally, the amount of untaxed alcohol a traveler can bring in is one liter (approximately 34 fluid ounces). A standard bottle of wine is around 750mL, or 0.75 liters, so this works well. Large quantities of liquid (say, a few cases of wine) may be a red-flag to border control only for tax purposes. They will not throw you in airport jail! If it seems to the officers that your amount could be used for commercial purposes (i.e., selling it), then it could be subject to duty and federal excise tax (that is to say, a fee for coming into the U.S. and an IRS tax). Duties and IRS taxes go by the type of beverage, its percentage of alcohol, and its volume (click here for the U.S. International Trade Commission [USITC] PDF file and here for the Tax and Trade Bureau [TTB] website). For example, if the border official insists you pay up, the duty on a bottle of wine with less than 14% alcohol content is around $1.59/liter and the IRS tax is $0.21 – bring that bottle home for well under $2.00! Waters, juices, and non-alcoholic beverages are also subject to taxes. The TSA doesn’t allow you bring beverages with 70% alcohol content (140 proof) or higher at all. You may take up to five liters of alcohol with alcohol content between 24% and 70% if it’s packaged in a sealable bottle or flask (click here for the TSA website). Anything higher than 24% alcohol may be subject to “hazardous materials regulations”. Alcoholic beverages purchased in duty-free shops can still be taxed upon U.S. entry. It’s only “duty-free” in the place in which you bought it! In short, please don’t be afraid to buy and bring home alcohol from your foreign excursions. I have yet to pay a tax on the ridiculous amount of alcohol I always seem to bring in (knock on wood)… But if there is a snag in your border crossing, the tax that may be placed on your purchases is minimal and even this is at the discretion of the border official. Go ahead and indulge!